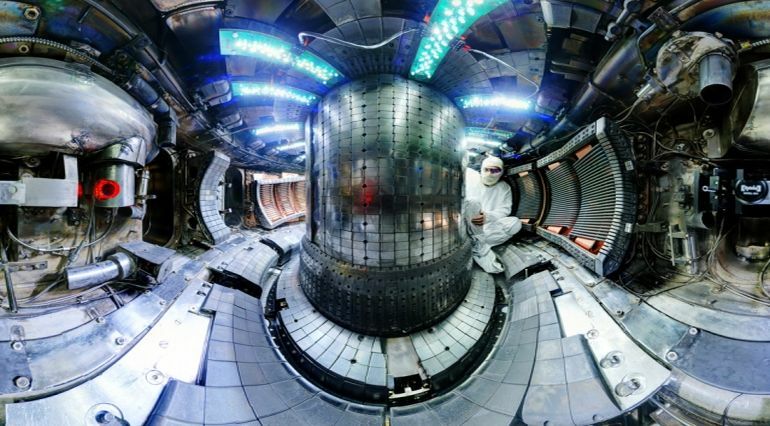 Inside MIT's Alcator C-Mod Tokamak nuclear fusion reactor. On the theoretical level, fusion, the process that fuels the sun, can provide unlimited clean energy for humanity. However, fusion-based power plants have seemingly been out of range from the realm of practicality, simply because scientists are not aware of many materials that could survive the punishing conditions concocted inside a fusion nuclear reactor. But a collaborative effort from Texas A&M University and the Los Alamos National Laboratory could potentially change this to make way for nanocomposite materials that would buttress the fusion nuclear reactors of the future. Helium is an element that we don’t usually think of as being harmful. It is not toxic and not a greenhouse gas, which is one reason why fusion power is so attractive. [However] literally, you get these helium bubbles inside of the metal that stay there forever because the metal is solid. As you accumulate more and more helium, the bubbles start to link up and destroy the entire material. We were blown away by what we saw. As you put more and more helium inside these nanocomposites, rather than destroying the material, the veins actually start to interconnect, resulting in kind of a vascular system. Applications to fusion reactors are just the tip of the iceberg. I think the bigger picture here is in vascularized solids, ones that are kind of like tissues with vascular networks. What else could be transported through such networks? Perhaps heat or electricity or even chemicals that could help the material self-heal.